Cast In Place Replaceable Dome Pads are applied in wet concrete, fastened with anchor hardware included with the pads. Cast In Place Replaceable Dome Pads are engineered to comply with Federal and State mandated detectable warning systems requirements. California ADA Title 24 compliant-CALTRANS Detectable Warning Surface approved. Included with Pads: Tamper-proof, stainless steel fasteners, Corrosion resistant hexagonal anchors and instructions. The replaceable feature of these truncated domes pads is the end result of more 20 years of design, testing and manufacturing of tactile paving tiles. 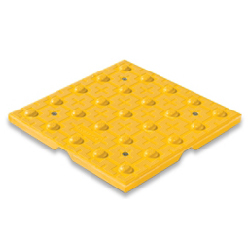 The two-part replaceable tile feature of these truncated dome pads is industry leading with its simplicity of design allowing for fast and easy replacing of paving tiles in the field. Installation of these ADA pads is easy and fast with no concrete demolition required, since they are applied when pouring fresh cement. The Diamond Grip Micro™ Prism Surface provides an enhanced anti-slip surface. ADA truncated domes are there to alert the visually impaired that they are entering an area shared with vehicular traffic. ASTM D 695 Compressive Strength of 26,900 make these the strongest and most durable pads on the market.